Though you have probably tried dieting to reduce the calories you take in, chances are your success was hampered by an appetite that wouldn’t go along with the program. Stomach rumblings and sugar cravings can beat down even the strongest of wills, and put a quick end to fool-proof diets. The question is, how can you control your appetite and reduce your sugar intake for successful weight loss? Applying pressure to a corresponding portion of your ear – called the Hunger Point – for 30-60 seconds can reduce your appetite and stimulate weight loss. 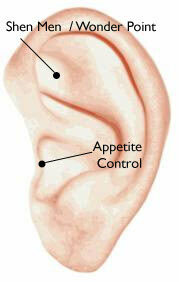 This area of your ear controls appetite, accelerates the brain’s “full” response, and releases endorphins or “feel good” hormones into your system. Since the Hunger Point is on the outer perimeter of your ear, you can press it with one finger, or pinch it from either side with both fingers. Since overeating is often linked to depression and mood swings, increasing positive hormones controls your appetite mentally as well as physically. Nutrition and exercise are still important but appetite and mood will make your efforts more productive, improving your chances for successful weight loss.